I am "home" with my family for a few weeks. It is a much needed break as my last month or so in Mozambique was pretty hard. While I'm here in the states, I'll be connecting with the churches that support me. Today I got to worship at The Vine and share with the children at their church. I am always blown away by this church and their heart to come alongside me and truly be a part of my ministry in Mozambique. Throughout this past year, The Vine helped 5 boys leave the streets of Maputo and return to their families. A team of 4 from the Vine even came over to visit me back in October and got to meet these 5 boys. Now their children's ministry is raising money to help another boy. A few weeks ago, I sent them information about a 12 year old boy named Antonio and they set out on the task of raising $500 so that Masana can help him return to his family. The children had the goal of raising all the money by Christmas. Well today, after only a few short weeks, they already have $560 and are going to try and come up with $1000 so that they can help 2 street kids return to their families!!! I was so blessed as I heard David Walters, the pastor of The Vine, describe to the church some of the ways the kids were raising the money. One boy went around to his neighbors with a jar and Antonio's picture and raised $50. Another little boy gave his birthday money. One girl drew pictures and wrote short stories and sold them to family and friends over thanksgiving for a total of $62. I am so touched by these little kids who have a heart to help one of the least of these...a young boy in Mozambique, Africa that they have never even met. Because of the hard of work of these precious little children, Masana is going to help Antonio return to his family. We'll buy him clothes and blankets. We'll make sure he is registered for school and has a uniform and all the supplies he needs. We'll even help him start up a small business so that he can contribute to his family's income. Thank you to The Vine for your love and support!!! This past Saturday, we took 12 year old Felix home. He is one of my favorite boys. He is one that really marches to the beat of his own drum. Sometimes I would pass him on the street and he would be marching around talking to himself and playing his make believe games. . .lost in his own little world. Anytime he saw me rather we were at Masana or on the street, he would greet me with "Malunga" (which means white person) and I would greet him back with "Mulando" (black person). He always made me laugh. This is the hard part about our work with the street kids...telling them goodbye when they are ready to return to their families. But it's so the decision I long to see every one of them make. Felix left home back in January after getting in trouble for stealing some money. He has been living on the streets for the past 10 months. I'll never forget the image of his father meeting us as we approached his house, stopping, and shaking hands with his son. It's so beautiful to see the hearts of children and fathers turned towards one another. Luis, my coworker, spoke to Felix about how its his father's responsibility to teach him and discipline him. He spoke to the family and neighbors about the need for them to look at Felix, not as a street child but as a they would any other child in the community. He encouraged them to continue guiding Felix in the right ways. Please be praying for Felix these next few weeks. Pray that there is no temptation to return to the streets. Pray for his family to be bonded together in love. This past weekend, Paulo Cossa, one of the boys that i was closest to last year at the Iris Children's center, passed away. Paulo came to live at the children's center just before I did in December, 2007. 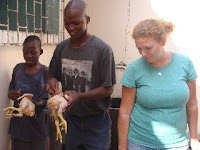 He was quite sick when he arrived but with nurses looking after his health and proper nutrition, he improved greatly. Paulo and Inacio were best friends and they were quite attached to me. And i loved that. We had so much fun together....from trips to the city for dinner at Mimmo's or going to the market to buy vegetables and then give it away to people in the community. Even after I moved to the city to work with street kids, Paulo and Inacio would come running anytime they saw my car driving into the center. But Saturday of last weekend, Paulo left us. He went to be with Jesus. I can say with confidence that he knew the Lord. Paulo was one of the most beautiful kid to watch during worship. It was obvious that he was lost in the presence of the Lord. 1 John 3:1 says, "how great is the love the Father has lavished on us that we should be children on God. . . and that is who we are." Paulo knew that he was a child of God. He was confident in the love of his Father. Paulo was such a beautiful young man. I am so thankful that the Lord allowed him to be a part of my life for a short time and that I was able to lavish love on him. Thank you to Chick Music in Athens, GA for donating this guitar to Masana!!! The boys are enjoying learning how to play. We have to keep reminding them that there is only one guitar and that they will have to take turns. They are all so eager to learn a few chords. And our worship times each day are much more fun with the guitar. The workers at the project are enjoying it as much as the boys! 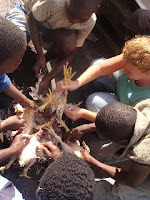 This week I have been reminded of just how different life is here in Mozambique. today some workers cut all the branches on the tress outside of my apartment building. hopefully it will take care of our mosquito problem! it was quite entertaining to watch as the men shimmied up the trees barefoot and chopped the branches with a hatchet. no buckets to lift them up or ropes holding them in case they fell or other "normal" safety measures taken. they didn't even block off the road to pedestrians so i just watched them running as branches fell. i was planning on taking my car to work today so that i could get the dent (see next story) looked at but my garage was completely blocked by the tree branches. T.I.M. yesterday, i parked my car outside of the church i work at in the city. the church is on the bottom few floors of a tall apartment building. as i was walking back from my portuguese lesson, the church guard called my over to look at my car. there was a large dent and white marks above the front wheel. he then began to pick up pieces of this "rock" that had fallen out of the window of an apartment above. the "rock" was actually sea coral and was knocked out of the window by a gust of wind. we eventually found the man who lived in the apartment with the falling coral. he takes no responsibility. . . says he rents the apartment and the sea coral belongs to the landlord so it's her fault. T.I.M. after the falling coral incident, i went to matola, a city about 20 minutes outside of maputo. there was a bad accident on the road. I eventually just turned off my car and sat for 45 minutes doing portuguese homework. they finally opened up one lane of traffic. there was an 18 wheeler carrying bags of cement involved in the accident so they were cleaning up all of the spilled cement. it took me 2 hours to get somewhere that should have taken 20 minutes. when i headed back to the city a couple of hours later, they were still cleaning up the accident!! the rush hour traffic was backed up for miles every chapa (public bus) stop was packed with 50 to 150 people waiting to get a chapa home. the woman who works in our house said she didn't get home until 9:00 last night and she left our house before 4:00! T.I.M. this is normal life in mozambique. and i do love it!!! addition to TIM: i took one of the boys, naldo, to the doctor today. he got stabbed last week and had to get 8 stitches. we were supposed to get them removed today. at the local health center, they told us to come back tomorrow because they didn't have any of the supplies they needed to see patients today. T.I.M. The first boys to arrive at the project this morning were Abrantis, Ernesto, Naldo, and Mario. Right away, Abrantis and Naldo gave me some money to hold for them in my pocket. I am always leery of guarding their money because usually its earned by stealing lights from cars and selling them on the black market. But I took the money and was quickly distracted by Abrantis, who we jokingly refer to as "Malouco" which means crazy person. He gave me some folded up newspaper and told me to open it. As I did, whatever was inside of it started to move so i screamed and threw it at him as all the boys laughed at me. It was some contraption they had made with paperclips, a rubber band, and the tab off a can of coke. Their joke was interrupted by an undercover police officer entering the project and asking to search all of the boys. He had followed them from the black market where he had watched them selling stolen lights. He asked that we gather all of the boys. Two of them quickly went to the wash basin where I heard the clanging of metal. I went and peeked inside the basin and saw that they had discarded the "keys" that they use to steal lights from cars which is actually a flat piece of metal. The police officer searched 8 or 9 of the boys. He found 2 lights in Mario's pocket. Surprisingly, the police officer was not there to punish the boys though. He is working in the black market to try and arrest the adults who use the street boys to steal things for them. So Pastor Paulo, our director, Mario, and 2 other boys accompanied the police officer to the black market to point out the people they sold stolen lights to. It's so encouraging to see the police targeting the adults who benefit from the kids stealing. If we see the day when the black market no longer exists, then maybe the kids will no longer steal. The rest of the day continued as normal.....we went to play soccer, had our church service, and ate lunch all together. A group of 10 or so of the boys walked me home so that they could get a soccer ball from my house. I gave them the ball and off they went to play at a court here in the city. An hour later, my doorbell rang. It was Naldo, Mario, and Jito. Naldo had a piece of scrap paper stuck just above his eye and it was soaked in blood. He had gotten into a fight with one of the other boys, Luis, while playing soccer and Luis cut him with one of the "keys" they use to steal lights. Thankfully, I live right across the street from central hospital. So i grabbed a washcloth to replace the bloody scrap of paper and off we went to the emergency room. After accounting the story of what happened to the worker at the front desk, a police officer, the doctor, and 2 nurses, we left the hospital with 8 stitches. And it took less than 2 hours which is pretty fast for an ER in any country!!! An eventful day to say the least. I love the boys I work with and I so desperately want to see transformation in their lives. We talk to them so much about stealing and fighting. They are such huge problems to tackle and I know that it is only God that can cause the change in their hearts. If they could only grasp His love for them and learn to love other people with this same love. Today Albano "Biggs" left the streets of Maputo and returned to Beira where his family lives. Biggs is 17 years old. He was living on the streets for the past 6 months. He originally came to Maputo to live with his uncle and work. However, his uncle got into some trouble with the police, sold all of Biggs' things and fled to South Africa. Sadly, this is a common story. Many young men come to the city in hopes of finding work and making money. It's not so easy though and they often end up living on the streets. I will miss Biggs. He is such a sweet young man. He would come to my house once a week and wash my car for me. Even this past Monday, he was walking down my street when I returned from South Africa and stopped to help me carry my things up to my apartment. I know that he needs to be back at home with his father but I hate to see him go. It's the bitter sweet part of my job. Please join me in praying for Biggs. Pray that his transition back to life with his family will go well. He'll be living with his father and stepmother. Pray also that he'll find a church to go to in his community where he can continue to learn about the Father. Biggs is very smart and has completed grade 8 so far. He's excited to return to school when the new term begins in January so pray also that everything gets sorted out for him to return to school. Last night before, Biggs stopped by my house one last time to say goodbye. Our last words to each other were "até nunca." Normally you would say goodbye with "até logo" which means "see you later" but for Biggs its "até nunca" . . . "see you never." And that is my prayer for Biggs...that he will prosper at home with his family and never again return to the streets of Maputo. 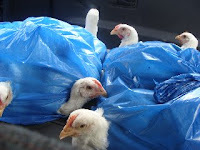 These were the chickens that became lunch on Children's Day. The pictures speak for themselves! Today we went to check-in on Emilton, one of the boys we have taken back to his family. He is doing so well!! 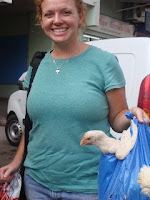 Morgan Collins, who goes to The Vine UMC, has sponsored Emilton's reintegration. She had sent a package for him with a few card games and some candy. So I delivered the package to him today and got to teach him how to play the games. There was one game called Blink that was so funny to watch as he was learning. Its a game where speed is the key to winning. His aunt was watching us play and just laughing the whole time!!! Thanks Morgan for sending that package for Emilton....he told me to tell you thank you for everything. Reintegration is a huge part of what we do at Masana. Our heart is to see the boys ready to leave life on the street and return to their families. Since January, we have taken 9 boys back home. For each boy that goes home, we meet with the family members, register him for school, buy him clothes, school supplies, a uniform for school, and other things he made need at home. For the older youth, we help them start up a small business. And with one boy we have had to help him build a small house as his grandparents live in a small hut that only has space for 2. If you are interested in sponsoring one of the boys as we reunite him with his family, please email me at solds19@gmail.com. 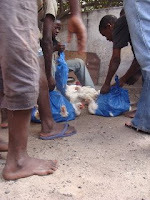 Here in Mozambique we have this horrible thing known as the the black market. its a very bad place. and here is why: it feeds the theft around the city. people steal things...such as lights off of cars. . . and sale them on the black market. then the owner has to go buy them back at the black market. this has happened to my car twice now in the past month. and each time it has cost me $120 to get the lights back. what a waste. Yesterday, we went to check in on 4 of the boys we have taken back to their families in the last few months. 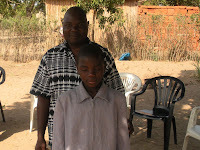 The first boy, Fazinda, lives in Maniça about an hour and a half from Maputo. We stopped along the way and bought 6 large sheets of tin for the construction of his house. Then we headed to Castigo's house which was over an hour from there. We got a little lost trying to find his house and a neighbor in his village had to get in the car with us and direct us to the right house! This was our first visit to Castigo and Fazinda since they had gone home so we took each of them a suitcase full of blankets and clothes. We'll return to their houses again in August to help them start up a small business. Next, we drove to Xai-Xai. I was determined that I wasn't going to backtrack an hour to the main road just to go back in the same direction. I knew there had to be a more direct route . . . and there was but it was mostly dirt roads. So the shortcut didn't really save us any time. But we made it to Xai-Xai where we visited 2 boys, Antonio and Leonel. Antonio was having some problems with the village chief about registering as a resident so we went to his house and spoke with his wife and got it all sorted out. Then it was off to Leonel's house. . . sadly at this point it was already after 3:00 and we still had more than a 3 hour drive back to Maputo so we did not stay long. All of the boys are doing well with their families! Leonel is the only one in school right now and he is making good grades. In January, when the new school year begins, we'll help the other boys get registered for schools in their communities. Antonio's small business of selling cokes on the beach near his house had failed but he surprised us with the news that he has gotten a job at a little shop near his house! I put together small gifts to take to each of the families - a plastic tub with some basic food items. And thanks to my brother, we were able to take a soccer ball to each of the boys...which was their favorite part of our visit!!! Monday night I went to dinner with some friends. As we left the restaurant, one of my friends, Dominique, commented on some strange noise my car was making. My car is always making some new strange noise so I didn't think to much about it. Tuesday night, I was driving home with Dominique after our children's day celebration in Matola and the car was doing really strange things. A chapa (minibus) behind me started flashing his lights at me. About that time I felt what I thought was a tire blow. I pulled off the road and as I did, Dominique looked out her window and said "the tire fell off." All of the lug-nuts were gone and the tire had fallen off! As we got out of the car, the chapa driver pulled up behind me and told me he was trying to tell me i was fishtailing. Thankfully there were a couple of guys standing right beside where the tire fell off. They very graciously volunteered to put the tire back on. We removed the lug-nuts from the spare tire and the guys got to work. It took quite a while because when I pulled off the road, only the front tires made it over the curb before the tire fell off. I do like to provide a challenge for the guys coming to my rescue! They were very kind though and even went and got chairs for Dominique and I to sit in while we waited. Still have no idea what happened to my lug-nuts. Stolen? Fell off? A combination of both? T.I.M. (This Is Mozambique)!! Then I taught the kids about the parable of the prodigal son and talked to them about being children of God. In the parable, the father gives his son a pair of sandals upon his return to symbolize his position in the family. We gave all the kids flip flops to remind them that they will always be children of God. Each child got gifts - a coloring book and crayons, flip flops, a tooth brush and tooth paste, and some candy. Nelson did a demo for the kids on how to brush their teeth! Next was musical chairs. We didn't have music so the youth helping me just sang random made up songs in Shanghan! The winner of each round of musical chairs got hoisted up in the air for a victory photo. Then the kids wanted to race. We paired them up and they ran down the path beside Lena's home, to the trash pile, and back. Finally, all of the kids got a piece of chocolate cake and a coke. And that was children's day in Matola. Thank you again to everyone at Sanctuary Baptist Church that gave so that I could do all of this for the kids. It really was so amazing to watch them enjoy the simple games and gifts. So much joy was brought to those kids through your giving!!! June 1st is a holiday here in Mozambique honoring children. The festivities surrounding the day are similar to Christmas - presents and a big dinner! At Masana, we had 27 street boys come to the party. We had a big lunch with chicken (that we killed ourselves!! ), potatoes, salad, rice, cokes and chocolate cake. Each of the boys received a gift bag as well full of candy, playing cards, a winter hat, and a pair of flip flops. It was such a fun day!!! The flip flops that each of the boys received had a lot of significance. Over the past months, God has continued to teach me about the prodigal son. 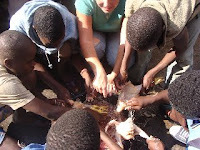 With each boy we have reintegrated, I've felt like I was watching this parable live. 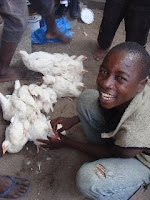 A couple of months ago, we reintegrated a boy named Emilton. You can read Emilton's story here. After this, the Lord really began speaking to me about the significance of the shoes given to the son upon his return home. Everyone who was a member of the family would have worn shoes...only servants went barefoot. So for children's day, each of the boys received a pair of flip flops. Luis and I did a teaching on the prodigal son and talked about the flip flops symbolizing their position as sons of God. My heart for the boys at Masana is that they would truly know their identity as a son of God. I want to thank everyone at Sanctuary Baptist Church for your gracious giving. The boys were so blessed!! !